As someone detects the "scar" on the desert's skin, simultaneously faces the initial thought (our fundamental intention): what could that be...??? 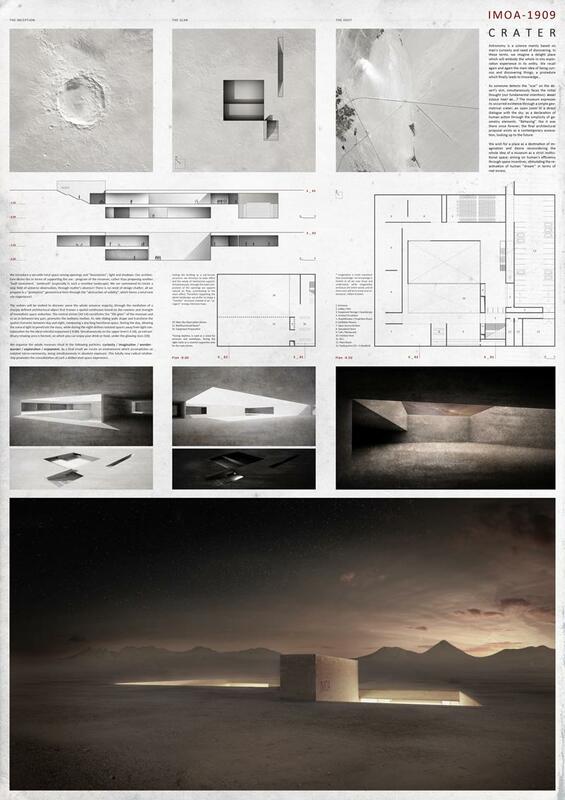 The museum expresses its occurred existence through a simple geometrical crater; an open room in a direct dialogue with the sky; as a declaration of human action through the simplicity of geometry elements. ‘’Behaving’’ like it was there since forever; the final architectural proposal exists as a contemporary excavation looking up to the future. We wish for a place as a destination of imagination and desire, reconsidering the whole idea of a museum as a strict institutional space; aiming on human’s efficiency through space incentives, stimulating the reactivation of human dream in terms of real excess. We introduce a versatile total space between openings and ‘’boundaries’’, light and shadows. Our architecture desire lies in terms of supporting the use - program of the museum, rather than proposing another "built monument - landmark" (especially in such a sensitive landscape). We are summoned to create a new field of universe observation, through matter's absence! There is no need of design chatter; all we propose is an ‘’protoplast’’ geometrical form through the "abstraction of solidity", which forms a total new site experience! The visitors will be invited to discover anew the whole universe majesty, through the mediation of a sharply defined architectural object that frames a spatial continuum based on the rawness and strength of immediate space seduction. The central plaza-atrium constitutes the ‘’life-giver’’ of the museum and as an in-between functional part, promotes the wellness motion. Its side sliding walls shape and transform the spatial character between day and night, composing a day long functional space. During the day, allowing the natural light to penetrate the mass, while during the night defines isolated spaces away from light contamination for the ideal celestial enjoyment. Simultaneously on the upper level (-4.50), an extraordinary relaxing area is formed, on which you can enjoy your drink or food, under the glowing stars. We organize the whole museum ritual in the following particles: curiosity / imagination / wonder-wander / exploration / enjoyment. As a final result we create an environment which accomplishes an isolated micro-community, being simultaneously in absolute exposure. This totally new radical relationship promotes the consolidation of such a deliberated space experience. Setting the building as a sub-terrain structure, we minimize the solar effect and its needs for mechanical support. Simultaneously, through the composition of the openings we support the natural air flow, contributing to the stack effect. Therefore respecting the whole landscape, we prefer to shape a humble structure instead of an ‘’arrogant’’ energy intensive mass. clean and conceptual great! Good job!